But we exceed your expectation. The helicopter is configured with a conventional pod and boom with a tail rotor. The cockpit accommodates three crew stations for the commander, navigator and the flight mechanic. The cockpit and the main cabin are heated and air conditioning is optional. An oxygen system is provided for the crew and for casualties in the ambulance and rescue variants of the helicopter. The helicopter has a five-bladed rotor constructed mainly of aluminium alloy. The helicopters have non-retractable tricycle nose-wheel landing gear suitable for landing on unprepared pads. 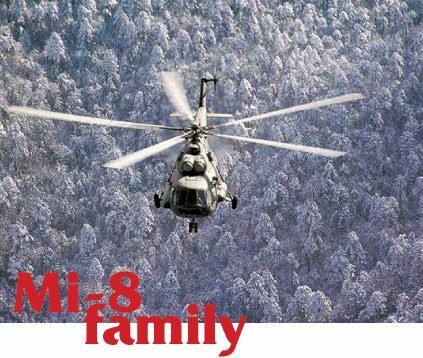 The Mi-8T helicopter is powered by two Klimov TV2-117 type turboshafts engines. Deflectors are installed on the engine air intakes to prevent ingestion of dust when taking off from unprepared pads. The helicopters also have an auxiliary power unit (APU) for self-contained operations. The helicopter carries 1,870 litres of fuel in two flexible internal tanks and two external tanks. The total fuel capacity can be increased to 3,700 litres by installing up to two ferry tanks in the cabin. Mi-17 (Mi-8MTV). The Mi-17 (Mi-8MTV) helicopter was designed and constructed at the Mil Design Bureau on the basis of the world-famous Mi-8 helicopter. During all the years of their existence, these helicopters have proved their worth in more than 50 countries. Its high operational reliability, ease of control and maintenance, have brought it to the world wide fame. 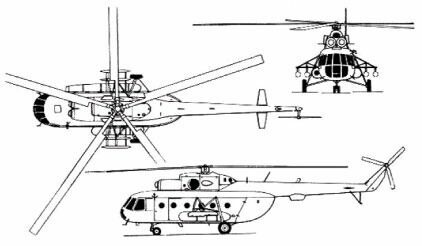 The Mi-17 added a number of improvements to its predecessor through design upgrades, specifically a special vibration damper. As a result, flying has become more comfortable both for crew members and passengers. The helicopter features a high thrust-to-weight ratio. Its power plant incorporates two TV3-117MT or TV3-11 7VM shaft-turbine engines with a takeoff power of 1,900 hp (1,400 Kw) each. If need be, the helicopter can fly with only one engine running on accelerated power (emergency power conditions for the TV3-11 7) with power brought to the level of 2,200 hp (1,620 Kw). The power plant has an engine synchronising system and a system for maintaining the rotor rpm. The engine input channels mount a highly effective dust-protective device, which cleans the air of dust and foreign objects during taxi, takeoff and landing. This has allowed the engine service life to be considerably prolonged. 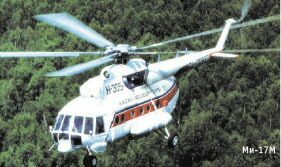 According to foreign specialists, the Mi-17's MTBF index is twice as high as in similar helicopters. Owing to the design features of the TV3-117 engine, the helicopter has improved altitude and climatic characteristics, a higher load-lifting capacity in mountainous terrain, in areas of high ambient air temperatures and a high static and service ceilings, which considerably expands its performance capabilities. The Mi-17 helicopter carries an AI-9V auxiliary power plant, which feeds the air starters of the TV3-117 engines; besides, it also supplies DC electronic power to on-board consumers when the aircraft is on the ground, and even when the main engines are shut off. The auxiliary power plant ensures reliable starting of the TV3-117MT engines on the ground and also on pads located at altitudes of up to 3,000m above sea level and of the TV3-117 VM engines up to 4,000m. If necessary, the helicopter's flying range can be extended. For this purpose the cargo cabin has one or two additional fuel tanks. The helicopter is capable of operations in any climate. The communication, navigation equipment and the auto-pilot permit it to fly in any weather, in any season and at any time of day. At customer's request, the helicopter can be provided with weather radar. The latter will help detect thunderstorm and heavy cumulonimbus clouds, and determine the degree of risk to the flight. The weather radar can also be used for navigation orientation. Besides, all helicopters can be provided with additional skids for landing on soft soil or deep snow, and also with a system to ensure buoyancy in case of emergency landing on water. 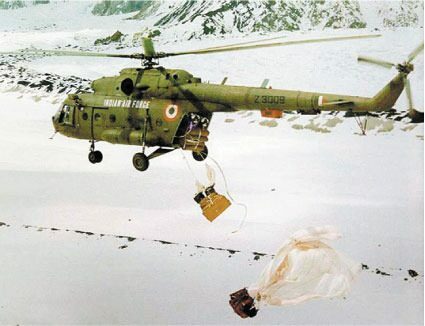 Even in such harsh conditions, the aircraft's MTBF was about 380 hours; Foreign experts have noted that the Mi-17 modifications used in UN missions featured certification of the number of flying accidents per 100,000 flying hours as being equal to 7.2, which is over half the mean statistical level of 16.7. Besides, the helicopter also displayed its remarkable maintainability. According to specialists, small maintenance teams managed to repair three quarters of all helicopters disabled in Afghanistan in the course of combat operations at the site of accidents or forced landing, after which the aircraft were capable of flying on to their bases. During the Afghan War, the Mi-8, which is a purely transport helicopter, often had to be re-roled without any serious modifications being done. Whenever necessary, it was used as a combat, ambulance or rescue helicopter. Those who fought in that war affirm that only the Mi-8 was capable of picking up the wounded from tiny landing sites in the mountains, hovering over them and touching down with only one wheel. The Mi-17 is capable of carrying cargoes in the cabin (including long cargo) with half-open or removed doors, external loads, or passengers (up to 30 people). The helicopter can also be used in construction/ erection work. with equipment to carry external loads and mechanised handling operations in the cargo cabin. The Mi-17 can carry up to 500kg cargoes, troops (up to 30) and wounded (up to 20); it can also be used for in-flight unloading of special cargoes. When installed on helicopters Mi-8 and Mi-17 this equipment is intended for creating facilities for rendering medical aid in transporting the sick and wounded, and also for sustaining vital functions when transporting seriously ill people to specialised hospitals. The medical equipment is arranged in the cargo cabin in the travelling and deployed positions. For feeding oxygen to litter patients, the cargo cabin has six sets of portable oxygen equipment, each including a KP-21 oxygen apparatus, a KM-15l oxygen mask and an oxygen cylinder with a capacity of 7.61 litres. At customer's request, the helicopter can be provided with sets of easily removable KKO-LS2 oxygen equipment for three crew members. This is actually an airborne medical complex. It includes special equipment developed jointly with Hungarian specialists. The equipment helps render qualified medical assistance to people in remote and inaccessible areas. 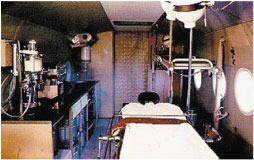 The cargo cabin has been equipped as an operating room (dimensions 5.34x1.8m). It can also house the medical personnel, equipment and accessories for treatment, surgical operations, re-animation, delivery and other medical services. The operating room has three exits. The room has good thermal and sound proofing. The walls are covered with panels made of materials that allow wet cleaning of the room for use with disinfectants. The operating room can effectively work both on the ground and in the air. Fluorescent and shadowless lights that illuminate the surgeon's workplace provide illumination. 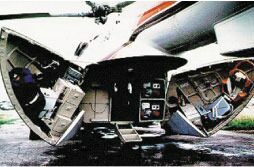 Two auxiliary helicopter carried petrol units effect power supply on the ground. Besides the operating table, the medical equipment includes an electrocardiograph, a defibrillator, an anesthetic apparatus, an oxygen supply system, surgical instruments, inspection lamps, a rescue bag and other items. At customer's request, the medical equipment can be supplemented with other articles or modified. Installed on the Mi-17 helicopter this specialist equipment is intended for fighting fires in residential, remote and inaccessible areas. The helicopter provides airlanding of firefighting personnel and necessary cargoes at the site of the fire. A hovering helicopter can carry people and cargo with a total mass of up to 150kg with the aid of a winch fitted over the fuselage sliding door. The easily removable firefighting equipment includes an SU-R forest-fire arrangement and a water-discharge arrangement. The forest-fire equipment includes a carbon lowering cord (50m long), three pairs of special gloves, brake units with suspension (4 pcs), suspension systems (3 pcs) and a bag for carriage and stowage of the forest-fire equipment with a SPTA set (for five equipment). The water discharge equipment is intended for intake of water from open water reservoirs, at least 1.5m deep, and carrying it as an external load to the seat of fire, where it is either poured out on the burning site from above, or the container with water is detached on the ground (with the helicopter hovering) for further use. The volume of water is 2 cub.m. The water discharge is controlled from the helicopter. At the customer's request, the helicopter can be provided with an RPR container and a 4 cub.m. container. The latter is carried externally; it serves for rapid laying of fire hoses in extinguishing forest fires. The overall length of the hoses is 1,600m. It is noteworthy that Mi-17 helicopters were successfully used in extinguishing forest fires in Spain. Is intended for jumps through the fuselage cargo hold with the doors removed, and through the aperture of the entrance door. For jump practice, the doors are removed. A special railing is fitted in the rear aperture of the cargo cabin, and cables are provided along the starboard and port side. A special light and sound signalling system serves for issuing commands to the parachutists; the system is controlled from the crew compartment. The mass of the equipment is 38kg. Make it possible to carry out daytime photography of routes and terrain areas from altitudes of 50 to 6,000m and flying speeds of up to 250km/h. Essentially removable equipment weighing 131.18kg. The area of skids: 1.74 sq.m. on the nose undercarriage. The specific load on the front skids is 0.17 kgf/sq.m., and on the main skids 0.14kgf/sq.m. Provides the helicopter with the necessary buoyancy to allow evacuation of the aircraft by passengers and crew. The mass of the system is 370kg. The cylinder is inflated in 10 seconds. The helicopter can remain afloat for at least 30 minutes. The system is electrically controlled. For 26 passengers. The passenger compartment has 13 double seats, wardrobe, luggage racks, and a heating and ventilation system. It also has good heat and sound insulation. The walls and the ceiling are faced with a decorative material. There are four exits from the compartment (two of them are emergency exits). Luggage is loaded through an open hatch in the aft fuselage. The flying range at an altitude of 500m with a 30 min fuel reserve is 570km. The salon helicopter is intended for carrying passengers in especially comfortable conditions. The passenger compartment is provided with soft armchairs, sofas and tables. There is also a vestibule, a wardrobe, a toilet room, and a collapsible trap door. Heat and sound insulation, heating, ventilation and air conditioning systems also ensure comfort. There are three versions of this helicopter: one-seat salon, 9-seat salon and 7-seat salon. Currently, a 6-seat salon for businessmen is being readied for manufacture; its tentative flying range is 1.700km. Used for regular qualitative and quantitative control of the environment and production facilities. The laboratory complex includes equipment for spectral map-making and photography of the terrain in the optical thermal spectrum, and a laser radar system for probing the atmosphere and the earth surface at various bandwidths. Besides, the helicopter carries diversified auxiliary equipment that comprises an aerial camera, a humidity meter, survey and radiological control instruments, a differential dust and liquid particle meter, and other equipment essential for ecological analysis and monitoring of the terrain.